Is there a good and a bad guy ? I had spent four years in my current role undergoing changes of scope, bosses. By Californian tech timing, the clock signaled to look for another role and probably for another region. The company was re-organising constantly. Thanks to my 14 years tenure across three continents I had built a good internal network. I started scouting for new positions. Rules said that all jobs needed to be posted and made available to all employees. Everybody knew that for senior positions, personal relationships opened up opportunities to land the right job. I was familiar with this exercise. I interviewed informally for an executive role leading a global transformation. The hiring vice-president was in a rush. I did my home work and thanks to some powerful recommendations I was sitting in front of a large screen, video conferencing in an air conditioned Singapore office. The interview was going smoothly when the hiring executive incidentally mentioned : “Ha by the way the position is based in California” - In a heartbeat I replied “No problem, providing I can live in San Francisco”. I had just made the decision to change continent in the blink of an eye. Couple of additional interviews later I was formally appointed and the usual craziness kicked off. There is always a time gap between the actual start of a role and your physical presence in the new location mostly due to the visa process. I obtained my formal appointment with the Visa service of the American Embassy in Singapore. During this application I realised how the USA attract foreign applicants from all over Asia. At times the number of applications to process was so high that shelters were built in the yard for applicants to wait protected from the heat or rain. Due to my corporate sponsorship my name was called quickly and I swept through the required bureaucracy. I overheard moving stories of people originating from various diaspora, proving they could be hosted by family members, they had a job or they would have a job and many variations of personal situations. It is one thing to see graphs with statistics and another to listen to moving personal stories. Business does not stand still. My boss was located in Berlin, I resided in Singapore, the teams I managed were based all over the world, my future home somewhere to be found in San Francisco, my official workplace in San Jose CA. This meant crazy flights and video calls with multiple time zones while waiting for for my L1 Visa. The L1 Visa otherwise known as the “slave visa” is sponsored by a company to move critical talents from one subsidiary to the next. It is nicknamed “slave visa” as once you are in the USA if you lose your job you cannot apply for another position unless the new employer is also willing to sponsor another visa. You have no grace period and must leave the country right at the termination date of your contract. I had accepted the rules, conscious that many foreign workers had a tougher life. A few months later my new file eventually started, my stuff packed in a container sailing on the Pacific ocean. I was used to long flights and trans-continental commutes yet I stressed out during this trip and lost my cool. I had in my hand luggage the whole file that needed to be stamped on arrival by the custom officer. Irrationally I feared that one document went missing. In our digital age this procedure reminded me of an archaic Ellis Island. I will not mention the long queue every traveler to San Francisco experiences. I took a deep breath and handed my documents, people standing behind me wished they had chosen a different line. It was standard procedure for the custom officer who was clearly welcoming a change to his boring routine. He started a nice chat while perusing through my file, checked the data in his system and finally stamped all the necessary documents. Bam, bam, the American eagle on my papers and a bright “welcome to America”, I was ready for the new chapter in my life. Adjusting to a new country has always been a challenge. I have not found any better way to step out of my comfort zone. After four years in Singapore and Asia I so loved, the change came as a shock. I had been working for Californian companies surfing many tech waves and I assumed I was fully prepared. I was proven wrong. I started my first hours in a hipster serviced apartment on Mission Bay, the heart of the creative San Francisco, surrounded by start-ups, fitness clubs proposing to reshape your body with numerous wearables and digital gimmicks. On that very first day I bought a pair of boots to stand the grey rainy weather and the cold unbearable after the daily 30 celsius of Singapore. To avoid driving and polluting, I commuted to work with the company connected bus among young geeks. In this office on wheels I could do my emails, early phone calls with Europe. I started attending series of pitches hosted by local innovative companies like Twitter. When sitting in the downtown office I took my coffee at “Blue Bottle” among CEOs of start-ups trying to convince various VCs and Business Angels. Money is flowing in the Valley and money decisions are made quickly. The speed and multiplicity of exchanges in the Californian digital ecosystem surpasses all the others. I joined a foodie network called Nommery. Dinners are scheduled on a platform at pre-selected restaurants. Whenever you are available and want to enjoy a friendly meal, you browse, check the guest list, pay-on-line and hop on an UBER en route to a trendy restaurant. The discussion will most likely focus on who has raised most money this week, which VC you know. Whenever I met somebody in San Francisco I felt I was thoroughly assessed : would I be useful in terms of contacts, money or skills ? Everybody was obsessed with money. The new hero was a young male CEO under 35 who succeeded to sell his start-up to one of the big Tech giants and turned into a serial entrepreneur, advisor, investor or launched a totally different activity as a pure passion. I met the founder of Dandelion Chocolate who sold his startup to Comcast in 2008. Masonis, a Stanford graduate and his partner applied brilliantly and very successfully engineering to chocolate making. Looking at the tribes of the digital ecosystem the tribe of the core builders in the Silicon Valley is particularly active and creative. The connections between all the tribes of the ecosystem are very dense and rich. The founders of start-ups can apply the latest management methods and new theories developed in the best universities and tested in active incubators that are world model such as Ycombinator. It created a funding model for early investment, replicated across the world. The incubator invests about 150k USD in each start-up and takes 7% equity. Their track record is impressive. Speed is of essence : myriad of new ideas emerge all the time. Risk is accepted : the failure rate of start-ups is the standard 90% but the cycle of creation to failure to rebound is shorter. I love history, literature and claim to have some knowledge in both subjects, in the Silicon Valley I struggled to find people interested or valuing both topics. Doing business, creating start-ups generated incredible vibes of energy and left me also somewhat disconcerted and sometimes bored. A leopard cannot change its spots. This experience of living East and West encouraged me to compare the two super powers that currently rule the worldwide digital ecosystem in terms of innovation, talents and investments. Depending on which side of the world you live you are led to believe they are very different but in truth are they ? Is there a bad and a good guy ? Any internet user traveling to China immediately experiences hitting a digital big wall when logging in. The initial goal of the internet was to create a free exchange between people, today the reality is different. Two super powers operate two separate internets with similar goals. Due to its size and influence in the region, China was in a position to create an ecosystem of its own. Like in the ancient times China built a digital wall to protect its digital world from a different kind of invasion. By blocking existing market giants it empowered the rapid growth of a native national ecosystem. Any business traveler to China is powerless without WeChat which has grown into a complete platform regrouping payment, food delivery, and the list lengthens. 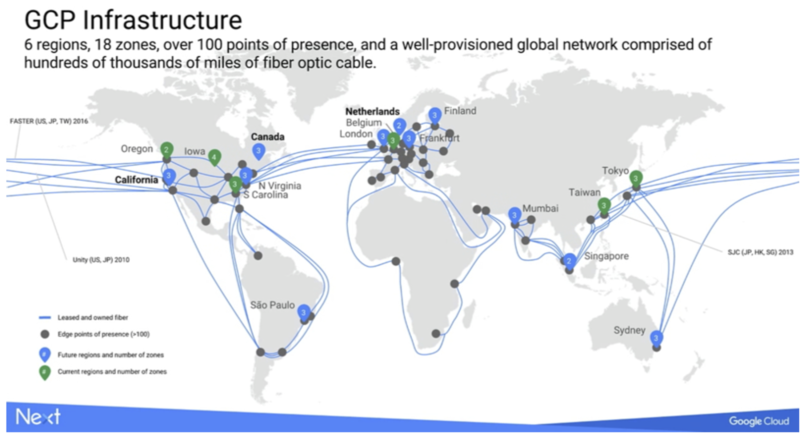 Tencent has reached over 1 billion simultaneous connections and its reach is expanding. 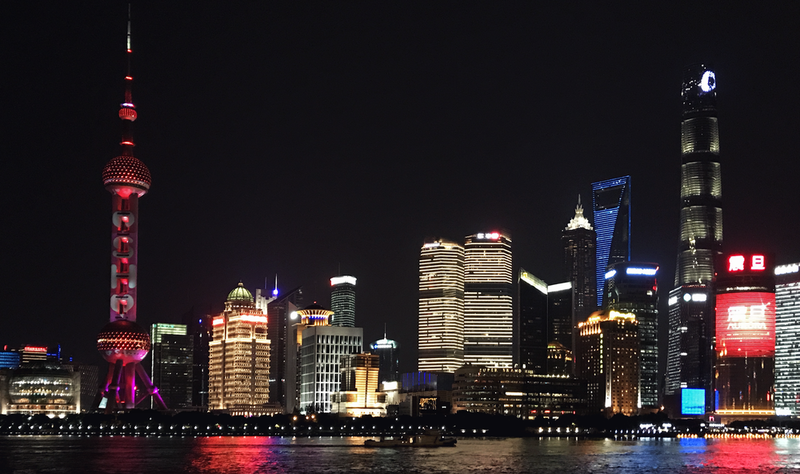 When I recently stayed in Shanghai I was surprised to see that the traditional exchange of business cards was overtaken by the sharing of WeChat QR code and addresses. Taxi drivers were asking for their fares to be paid by WeChat Pay. I felt totally obsolete with my debit card and cash. Mandarin and a strong culture re-inforce this state driven autonomy. Even if Chinese learn English with amazing speed and results the preference stays with local language, local contents especially for music and video streaming. The long term strategy of Chinese investors who invest large amounts and do not hesitate to re- invest in order to gain the market and suppress competition. investors” by Coco Liu (15/04/2018) summarises the growing alliance between the two ecosystems. By pure numbers Chinese focus on the broad Asian digital ecosystem with an overall population of 4,4 billions, with young people more and more connected in the ecosystem with their mobile makes a lot of sense and seems to guarantee to China a long term digital leadership. The historical maritime hubs tend to attract active digital ecosystem as all the tribes flourish there. It is interesting to see that in the US key industries like healthcare in Minneapolis or Automobile industries attract digital ecosystem inland. 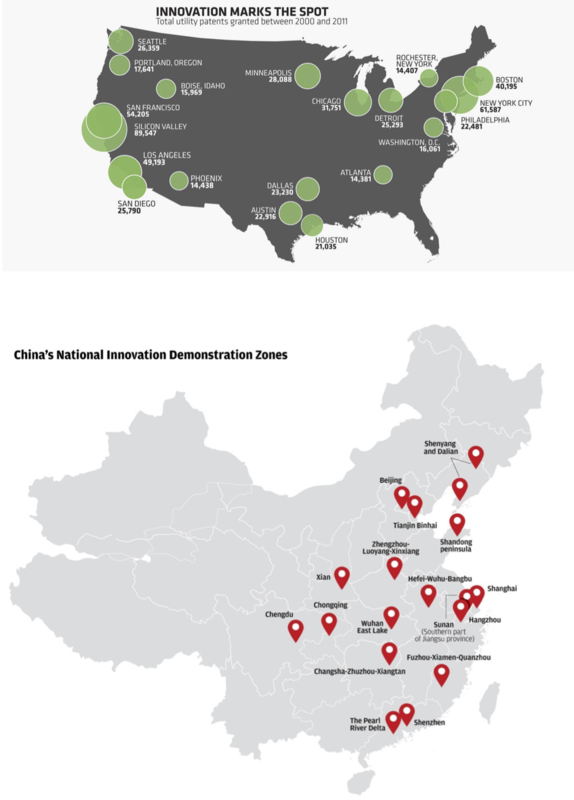 For example Chengdu a main flights exchange hub and otherwise known as the iPad city, 1/3 of the iPads are manufactured there, has attracted 29,000 enterprises. Likewise major state investments have poured into Chongqing and Xian, heart of the silicon industry, to develop strong digital ecosystems. In both countries the digital ecosystems spread inland. Likewise the financial powers of the GAFAM is enormous at the end of 2017 the cash held by the GAFAM amounted to 546 billion $ more than the GDP of Sweden. However beyond the sheer financial power, the true wealth of the GAFAM is their access to an incredible quantity of data. exabyte data. This equals to 30 million PCs combined. We have seen by their sheer size Chinese giants collect the same amount of data. The nation-wide face recognition programs adds to the variety of data collected. The face recognition start-up Sensetime that raised $600 million most led by Alibaba demonstrates the Chinese focus on AI and collecting data to come up with powerful algorithms. Big data combined with the right talents means generation of Artificial Intelligence. . These two parameters have been and continue to be the propeller of AI and give both ecosystems a long advance. If China is winning the AI software battle mostly due to the volume of usable data, low regulation and availability of skilled engineers the manufacturing of suitable microchips is missing. Currently the US manufacturers : Advanced Micro Devices Inc. (AMD), Intel Corp. (INTC), Nvidia Corp. (NVDA), Qualcomm Inc. (QCOM) lead the pack by far and fear future made in China cheap chips (pun intended). Will this dual digital ecosystem and this battle to remain or become the key foundation of the worldwide digital ecosystem benefit the users, consumers and citizens ? Will we be trapped and forced to chose an option and hence lock ourselves in a system ? So is there a good guy and a bad guy. Depending on where you live your answer may vary. If you are a European and feel like you have to give the key of your house you probably think you have to choose between two bad evils. If you are in Africa where you can select the highest bidder you may have the impression you face two good guys. Reality is that both are so far advanced the rest of the world can only play catch-up.